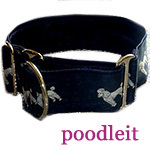 This article was originally published here on the Poodle blog in 2011. Because I have been speaking to several people recently who are deeply grieving a beloved pet, I decided to update it and repost, in hopes that it might be of comfort to someone. I have sat where you are sitting. I have stood where you are standing. I have stood frozen with my hand on the door because I dreaded opening it--I did not want to go into a house that was missing the dog I so deeply loved. A friend of mine is today, as I write this, grieving a dog that she lost way too young. I want to share something with you what I just shared with my friend. Although at times it feels like yesterday, it was ten years ago that our lovely Standard Poodle Lizzie was diagnosed with lymphoma. We spent the summer that year driving her back and forth to a wonderful veterinarian that was almost an hour and a half from our home. She did not respond to the treatments as well as we had hoped. Often her blood count would drop dangerously low, and she would have to miss a week before the next treatment, until she was stronger. We were told that dogs do not lose their hair from chemotherapy treatments. But Lizzie did. Poodles don't have the same type of hair as most dogs, their hair is more similar to a person's hair and it did start to come out as the weeks passed. It was hard to see our lovely girl with bald patches, and even harder to watch her stumble when we took her outside to play. Her lymphoma had spread to her neurological system. That August we made the decision to stop the treatments, and Lizzie had a fairly comfortable month before it was time to let her go. When it was time, our local veterinarian was kind and compassionate. Lizzie was only eight years old. I was totally unprepared to lose her at such a young age. In addition, my teenage son had just been diagnosed with cancer, and was in between surgeries at the time that Lizzie left us. I was an emotional wreck. One day while sobbing on the phone, I told a friend that the thing that bothered me the most was the thought of Lizzie sitting at the "Rainbow Bridge" looking for us. Lizzie had some separation anxiety during her life, always acting very distressed as we walked away if we had to leave her for boarding or even grooming appointments. My friend told me that years ago when she lost a beloved dog companion, she had asked God to show her what happened to her dog after he died. She did not tell me what she had experienced, but just encouraged me to pray that God would show me. Several nights later, I was laying in bed, praying and crying softly while I asked God again to please give me some peace about Lizzie. I told God how I hated the fact that there is nothing in the Bible that tells us for sure that our pets will be in heaven. I am not sure if I was asleep or if it was a vision just before sleep, but suddenly I could see....the most gorgeous green grass, unbelievably colored flowers...and there was Lizzie, playing with some children who appeared to be around six or seven years old. Lizzie was performing some of the "tricks" that I had taught her years before...a child was giving her the cues and she was doing her "spins" and "sit pretty", while the other children were clapping their hands with delight. Then they would run and she would run...and they would flop down on the grass with her. Lizzie was giving kisses and receiving hugs. But best of all...Lizzie was totally focused on these children and she was definitely "in the moment", very happy, not looking around or showing any signs at all of worrying about anything. Her coat was beautiful and black again, and she was full of life, no stumbling, no sign of illness in any way. There is a Steve Green song called "Safely Home" that is written as if God is speaking to us after we have lost someone we love. it says "They are strong...and free...they are safe...with me". Last week (update, 2011) we lost our Gusto, a/k/a "Goose", an older Standard Poodle who lived with us for the last five years after his owner passed away. Goose was the happiest and most cheerful doggie soul I have ever known. I hope that today he is being a clown, playing tennis ball (his favorite) perhaps with children who have always longed for a special dog like him. They may not have had a dog while they were on earth, but Gusto can give them great joy now. I am sure they will find him a fun and most faithful friend. But still, my heart longs for him and misses him. Deepest empathy goes out to my friends who have recently lost special dogs...Silvia, Teresa, Veronica, Maria, Cleeta, Peter and Johnnie. I know how much it hurts and my heart goes out to you. But have peace and know that they are...once again....strong and free.